“Dad was diagnosed with cancer of the oesophagus in August last year. Daily radiotherapy and weekly chemo started in October, after Dad had been on his holiday and climbed 2000ft! 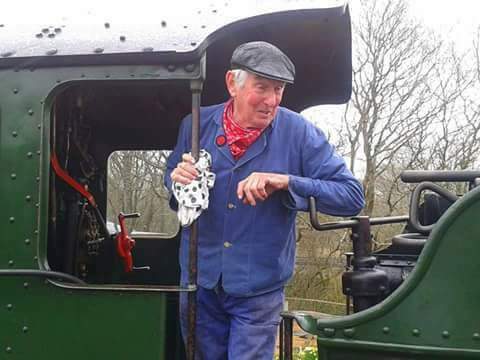 He was an incredibly fit, 78 year old who still drove his beloved steam trains at the South Devon Railway, he was the longest serving steam train driver in the country. He became critically ill on December 12th and by the 21st we were told that there was nothing else that could be done for him. After one more night in hospital on full oxygen, Dad decided he didn’t want to be on it to that extent and wanted to get home. On Friday morning, we asked the consultant if we could get him home. We were told as it was the Friday before Christmas it may not be possible but within an hour we had met a Rowcroft Hospice at Home nurse who proceeded to move heaven and earth to get Dad home. We all played our part so they could put things in place and by 8pm Dad was at home, in a hospital bed in his conservatory with an oxygen cylinder. Dad could not wait to see the sunrise and their beloved garden and the Saturday morning was beautiful and sunny. Throughout the day Dad had a string of visitors, his lifelong friends came to say goodbye to him which was heart-breaking but he had a wonderful day, he even ate ice cream and drank coke! We knew by lunchtime thanks to the Rowcroft nurse that Dad had just hours left. We laughed, cried and put on a big spread, just like any of our normal family gatherings. Nothing was left unsaid and Dad told us not to be sad because we would be fine. Dad thought that he’d had Christmas and thanked us all for a lovely day.